Chevrolet will tout 30-mpg fuel economy when the restyled, re-engineered 2010 Equinox goes on sale next summer. "It is a refined yet responsible crossover," said Ed Peper, General Motors' North American vice president of Chevrolet. Peper called the crossover segments important "because the market for both compact and mid-sized crossover vehicles has grown steadily since 2003. Both of these segments are forecast to continue their growth trends in the next few years, and Equinox gives Chevy a volume player in this very critical market." Through November, Chevrolet had sold 61,700 Equinox units. In 2007, 89,552 Equinoxes were sold, down from 113,888 in 2006. "We're going right after the Honda CR-V and Toyota RAV4," Peper said at a press briefing last month. "That is what this vehicle was designed to do." Peper said fuel economy is the top priority for buyers in these crossover segments. The Equinox gets an estimated 21 mpg city/30 highway and is estimated to go from 0 to 60 mph in 9.5 seconds. The Equinox's first four-cylinder engine and the addition of a six-speed automatic transmission are the main reasons for the boost in fuel economy. The base engine is GM's new direct-injection, 182-hp, 2.4-liter powerplant, which makes 174 pounds-feet of torque. Peper expects the engine to account for about 70 percent of Equinox production. 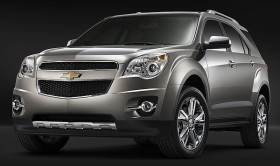 The base engine on the 2009 Equinox is GM's 185-hp, 3.4-liter V-6, which makes 210 pounds-feet. The Equinox with that engine gets 17 mpg city/24 highway. Other contributors to the increase in fuel economy include low-rolling-resistance tires, electric power steering and improvements in aerodynamics. GM's new direct-injection, 3.0-liter double overhead camshaft engine with an estimated 255 hp and 214 pounds-feet of torque is optional. That engine is expected to deliver 18 mpg city/25 highway.